We have been working for years on this project: creating furniture that challenges time and respects nature. Riva 1920 has been producing furniture for three generations. Anna, Maurizio and Davide Riva are currently leading the company, started off by granfather Nino Romano in 1920 and carried on by their father Mario Riva. In the past 20 years, the company was committed to producing furniture with only and exclusively natural materials and complements, guaranteeing low environmental impact. While thinking of the future and young generations, Riva 1920 inaugurates in 2001 the Museum of Wood, to hand over and not forget that wood is a renewable resource, but it is not infinite: only an aware use and a correct integration policy of the arboreal heritage can guarantee a balanced ecosystem in the future. Culture, design and social sensitivity have become key features of Riva 1920’s activities. The collaboration with design masters strengthened a philosophy characterized by a merging of functionality and aestetics, without ever forgetting the importance of healthy living and eco-sustainability. Special Projects were born out of this marriage between woodwork and geniality, such as the project aimed at re-utilizing Venetian Briccole, the millennial New Zealand Kauri wood, and the project Ground Zero, to remember the history of 9/11 through design masters. 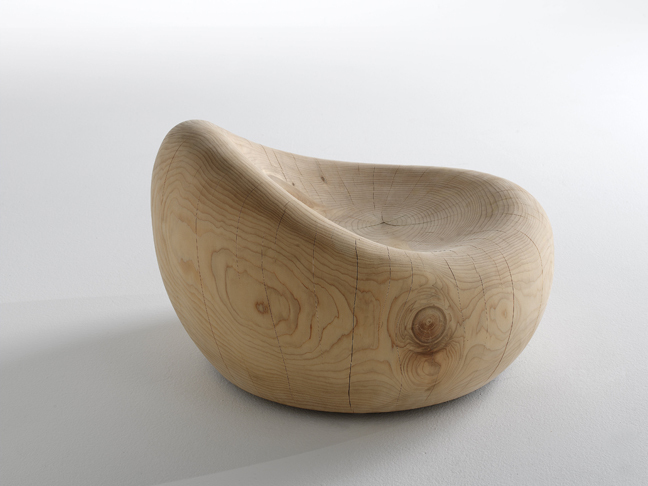 Description: This armchair is made of scented cedar wood and it is carved out of a single block of wood with a 75 cm-wide diameter or larger. It is hand-finished. Its sinuous shape, characterized by the peculiar concentric circles of the cedar trunk section, makes out of Maui a true work of art without equals. It is a furnishing element ideal for both indoor or outdoor spaces (preferably covered). It should not be exposed to direct sunlight, or contact with water and ice. Any cracks or splits, before or after sale, are absolutely normal, being typical features of solid wood that, as it ages and becomes seasoned, moves according to the different conditions of the setting and humidity of the air. 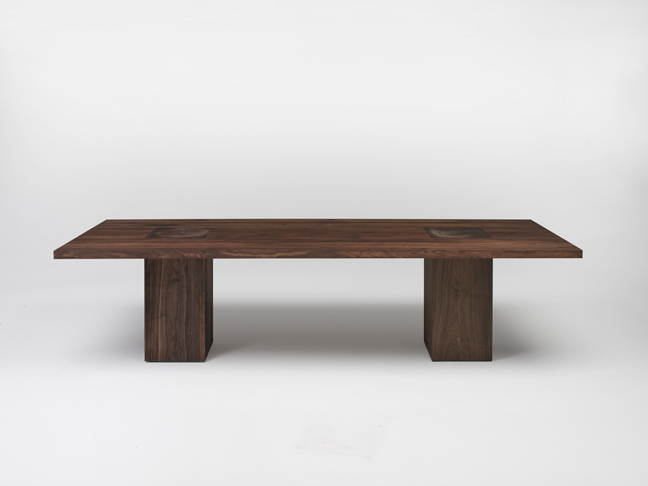 Description: Table in solid walnut. Crossover legs visible on the top, made from tree trunk sections. Any cracks or splits in the table legs, before or after sale, are absolutely normal, being typical features of solid wood that, as it ages and becomes seasoned, moves according to the different conditions of the setting and humidity of the air. Available only in oak and walnut with knots. It can be custom-made. Description: Nature and its naturalness make the top of the Bedrock Plank table a unique and inimitable piece. The top, made of solid walnut wood, featuring 5 cm-thick natural sides, perfectly marries the raw-iron base that is hand-shaped and soldered. 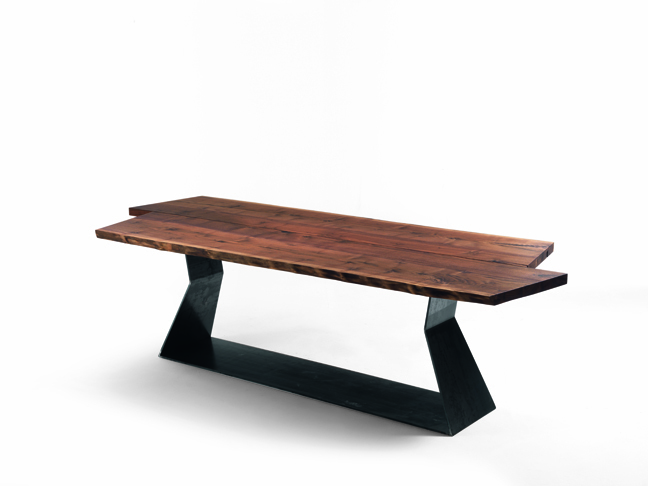 Available finishes: table top made of walnut solid wood featuring knots, or oak wood featuring knots. The tops of tables requested “with knots” are treated with a special black-coloured wax that is heated and once liquefied, it is poured onto the knot. Time is allowed for the wax to cool down at room temperature. Once it solidifies, it thoroughly covers up the wood knot. It is possible to encounter wax “crystallization” effects or colour variations over the table top. This is a normal consequence of the waxing process and the spots can be faded through the use of a steel wool provided with the maintenance kit. Also the number of knots and their dimensions over the table top can not be a reason for complaints, since they represent a natural feature of true solid wood “with knots”, finished with natural oils or waxes. The top of the BEDROCK table is extracted from solid sections of tree trunks. Any cracks or splits in the table legs, before or after sale, are absolutely normal, being typical features of solid wood that, as it ages and becomes seasoned, moves according to the different conditions of the setting and humidity of the air. The top of the BEDROCK table is usually made of two boards with natural outer sides. Table base made of iron plate, natural colour, finished with oil (standard version).